Even though the cut surfaces are flat, they appear to expand outward like glistening bubbles. 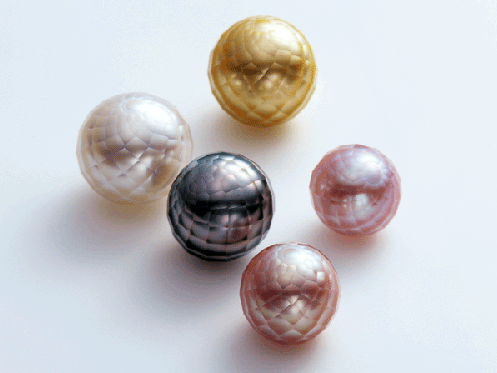 The mother-of-pearl shows through on the surfaces of these glamorous and beautiful masterpieces, which are named “Faceted Pearls.” These ever-evolving jewels make use of polishing techniques that have been developed over time and handed down from the first to second generation of Komatsu Cutting Factory. These works are the result of true craftsmanship, which is at the top level in the world. “Faceted Pearls” are the world’s first cut pearls. Komatsu Cutting Factory has further enhanced the natural brilliance and beauty of pearls by utilizing its diamond cutting techniques. Diamonds only shine once the raw stone has been polished, but pearls are naturally shiny. Komatsu has conducted extensive research to find how the human hand can make pearls even more beautiful, and the glamorous and mysteriously radiant Faceted Pearl was thus developed. 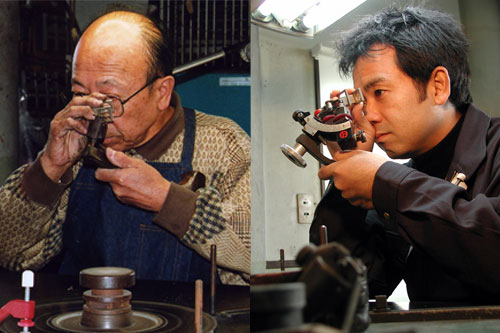 The founder and previous president of Komatsu Cutting Factory, Kazuo KOMATSU, was in the business of polishing diamonds. In the diamond industry, cutting techniques were carried out keeping the various jobs completely separate in order to prevent the overall process from being leaked to outsiders. Komatsu was seen as possessing good skills and integrity, so he was able to learn all of the processes. He was highly praised for his advanced skills. After establishing his own business, he used his remarkable skills to polish some of the greatest diamonds in the world. Komatsu has also cut various types of jewels aside from diamonds. In the cutting business, there has been increasing demand for low cost over quality, so the work has been flowing to Southeast Asia. In order to overcome this situation, the previous president came up with the idea of cutting pearls. This was something that no one had ever tried before, and it was extremely difficult. 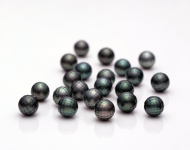 Pearls grow when many thin layers of mother-of-pearl accumulate around a core. It is very difficult to cut a pearl while keeping the core invisible. Komatsu sought to do this by using techniques for polishing diamonds. Hana Shinju (Faceted Pearl), which was created by carving pearls for the first time in the world, has shine and texture completely different from those of original pearls. After 10 years of considerable efforts, Mr. Komatsu’s father, the founder of the company, introduced Hana Shinju into the market. Currently, Mr. Komatsu is engaged in designing pearls. Hana Shinju had hard time being accepted in the Japanese market where people have stereotyped image that pearls should be spherical and smooth. Jewelry makers in the U.S. and Europe first paid attention to Hana Shinju and evaluated it highly. Through presentations at overseas exhibitions, exchanges with parties interested in Hana Shinju increased, and it was adopted by an Italian designer brand Scavia, among many other overseas customers. Mr. Komatsu intends to start manufacturing end products such as necklaces, in addition to selling Hana Shinju to jewelry manufacturers as materials, thus nurturing the business into a brand.